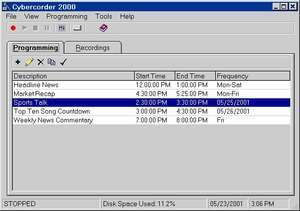 Cybercorder 2000 is an audio capturing program which can record things being played back on your system. It can record onto mp3 or wave files and the saved files can be played back at will. The interface of this software resembles a VCR with your typical play, pause, record and fast forward buttons. End files are compressed to save disk space. Cybercorder 2000 1.4 Rev 3 is a shareware program and can be used as a demo to try the software until the free trial period has ended. A full version of the program is available after the trial period ends. For security reasons, you should also check out the Cybercorder 2000 download at LO4D.com which includes virus and malware tests. Additional screenshots of this application download may be available, too.